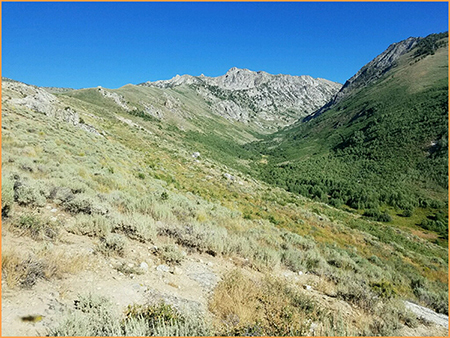 Over the course of two deployments, four search team members plus three K9s (Anton, Rekker, and Gunny) from Great Basin K9 Search and Rescue deployed to a mountain range inside the Humboldt National Forest. We were three of several K9 teams deployed on the search for a hiker who had been missing for two weeks. These mountains are so rugged they are referred to as "Nevada's Swiss Alps". We were not expected to search the entire mountain range; however, there was very little information regarding where the hiker could be. His car was found in an area not in agreement with what his "plan" had been, and sightings were in two completely different areas. "Area" meaning hundreds and hundreds of acres apart. Team Anton’s assignment started out at a pass trailhead. With 40 lb. back packs, walking poles and chest packs equipped with GPS, radio, and other emergency gear, we ascended 1,700 feet in just 3.5 miles to well over 10,000 ft. The photo above is two team members and K9 Anton surveying our "area" after arriving at the pass. Our area consisted of more than 500 acres of steep, rocky, difficult terrain with three lakes, one of which is pictured. Our assignment with K9 Anton was to clear this vast and arduous terrain with very steep inclines and descents in two days. This would be a difficult search for everyone, but, special attention needed to be paid to the dog who would face heat, holes, insects, foot wear, and wild animals. We had prepared and packed medical supplies for any situation. K9 Rekker’s assignment was in a completely separate area, miles away. The photos below are of team Rekker’s area – also vast, rocky, and sloped. We knew in advance that we would spend the night in the field and used our mapping tools and visual assessment to put together a plan. We had three lake perimeters to clear plus the surrounding basin area. On our descent to the first lake the plan changed. K9 Anton showed a change of behavior consistent with target odor and took us off our original charted course by a great distance. After many hours of traversing steep ridges and deep drainages, we ended up at the second lake pictured here. We set up camp at this lake and then searched what we could before nightfall, clearing the perimeter. The rocky wall seen here is what we would need to search on our way up to the third lake in the morning. It was a steep, back breaking trek up to this lake. Upon arriving, we did a perimeter search the best we could as the lake was fairly choked by willows. We relied on K9 Anton to search these areas sufficiently that we could feel confident the area was clear. Here is the third lake. After reaching and trying to search our furthest destination, it was time to make the entire trip back through the pass to the trailhead while searching as much basin terrain as possible. What had taken us two days to arrive here, now had to be completed in one. We had to be to our extraction point by 1700 hrs. Period. The hike back to the trailhead was grueling. We sought out, searched, and cleared every ridge and drainage we could while keeping our minds on the time. We were scrambling on hands and knees up deer trails and traversing loose rock hillsides, all while watching K9 Anton for any slight change of behavior or indication of target odor and also while making sure he was adequately hydrated and rested. In the end, we did not find the hiker but we were able to give incident command some information which we hoped would prove useful based on Anton’s odor alerts relative to wind direction. According to the track records generated on their GPS collars, K9 Anton and K9 Rekker covered more than 52 miles combined during this deployment. We left the area having provided information, but with more questions than answers. 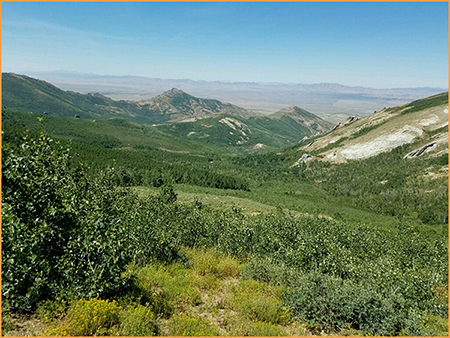 After arriving back in Utah and as additional team members were preparing to go back to the search area, the hiker was located in an area that had not yet been searched by K9 or other search teams. From this search, we found out it is possible for every body part to hurt. We went into the field with determination, carrying the burden of knowing a family depended on us to be prepared, qualified, and dedicated to finding their loved one. We found out you can care about a mission so much that it stays with you and consumes your every thought for days, weeks, and maybe longer. What could we have done better? What could we have done differently? Did we miss any clues? We found out our search areas can be unimaginably beautiful yet treacherous, unforgiving, and deadly. We found out we can trust our dogs because they are strong and dedicated to their job. We found out rehydrated foil pouch dinners taste really great when you’ve hiked, scrambled, and trekked all day. We were fortunate that daytime temperatures did not rise higher than the mid 80's or we may have had real risk of heat injury for the dogs. The dogs often don’t know when to stop. Even after the search, they needed several days of rest to fully recover. So, if you think you and your dog are suited for and would like to pursue K9 SAR, this is just a sample of the hard reality. K9 SAR is a mission, not an activity.